Therefore the offering of the Church, which the Lord directed to be offered in the whole world, is accounted a pure sacrifice with God, and is acceptable to Him, not that He needs a sacrifice from us, but because he who offers is himself honoured in his offering is his gift be accepted. By his offering, both honour and affection is shown to the King. And our Lord taught us to offer this in all simplicity and innocence (Mt 5:23,24). Therefore we must offer to God the first-fruits of His creation, as Moss said. Offerings are no longer offered by bondsmen, but by freemen… They [Old Testament saints] offered their tithes; but those who have received liberty set apart everything they have for the Lord's use, cheerfully and freely giving them (2 Cor 9:7), not as small things in the hope of greater, but like that poor widow, who put her whole livelihood into the treasury of God (Lk 21:4). Have you ever thought about how much God has gifted us? Most of us don't have to worry too much about having a roof over our heads, about putting food on the table, or about clothes on our back. Instead, we live in a time of abundance. Others are less fortunate. They don't have the basic necessities of life that we so often take for granted. Here's where we can make a difference in their lives. God wants us who have plenty to share with others who are in need. That's what "stewardship" is all about. It's a big word, but what it really means is being good "caretakers" of the gifts God has given us so that, when the time comes, he can use them to take care of others. You see, the possessions we have aren't really ours to keep for an eternity. Anybody who's had a fire in their home knows how true this is. Or when we've lost a loved one in a fatal car accident. The same thing goes for anyone who's spouse or child is healthy one minute, sick the next. Rather, God wants us to be stewards. You see, God has blessed us so that we can bless others in turn. And then when it's our turn, when we are in need, others can help us. Time. One of the greatest gifts God has given us is the gift of time. Time for family. Time for school. Time for work. Time for prayer and for Church. Yet we know that there are only so many things we can do in any given day. So God asks us to choose wisely. We can be good stewards, that is, good caretakers of the time God gives us if we divide it up well. Some time for ourselves, some for our families, and some to help others. We need time for ourselves to ensure that we eat properly, get enough rest, exercise, and, of course, pray. Those that are close to us also need our attention, including our family and friends. Still others depend upon us to care for them out of love. We don't often think about them. We don't even want to think about them. But they're there, waiting for us to use some of our time to help them. They're the ones like the elderly and shut-ins who are waiting for us to visit them, even if just for a few minutes. The same goes for the sick and the imprisoned. Or have you ever made a sandwich with your own hands and given it to a poor person? Ever consider becoming a Big Sister or a Big Brother, or teaching someone to read, to ride a bike, or to drive? Or even closer to home, instead of showering your kids at Christmas with expensive toys, have you ever just given them the gift of time, doing whatever they want to do for just an hour or two? The gift of time. Being good stewards of our time. Being good caretakers of our time, for ourselves, for our family and friends, and for others. What do I do with the gift of time God has given me? God has gifted us with so many different talents. For example, every Sunday one parishioner made coffee and put out juice and donuts for the kids. Another lady would come to church on Monday morning and painstakingly put the liturgy books in order and remove any left-behind bulletins after the Sunday services. No one in the parish asked them to. They just did it out of the kindness of her heart. That was their gift of talent to the Church. Some of us can teach. Some of us can sing. Some of us are good listeners. Others are good leaders. Some of us can brighten up a room with a smile or a joke. Others can count. Still others can replace a light bulb and fix things. And some of us can even pat our heads and rub our tummies at the same time. All of us have talent. There's no doubting that. That's the way God made us. The big question is what we do with our talent. And not just for ourselves but for others too. That's why God gave some talents to some people, and other talents to other people. Not all of us have all the talents. So we need each other. And that's what it means to be good stewards of our talents. They're really God's gifts. God gives them to us as caretakers, so that he can use them to help others come to know him, come to love him, come to serve him. What talents have God given you? Just you and no one else? And what are you doing with them? Someone once said that it's no crime to be poor. Someone else retorted but it's no great honour either! Treasure comes in many forms and shapes. Money. Investments. A house. A car. Jesus may have preached more on treasure than any other subject. Why? Well perhaps he knew that treasure can just as easily be used for bad as for good. It can just as easily corrupt as be a blessing. When it comes to treasure, we need to ask ourselves three questions. How did I get it? In other words, did I come upon it honestly, did I work hard for it? Or did I steal and cheat others for my own personal gain? What am I doing with it? Do I spend it on things I truly need or do I waste it on luxurious things that I could rather do without? And what's it doing to me? Is it making me a better person, or do I hate myself and others for it? The answers to these questions can tell us a lot about our attitude towards treasure. Again we are stewards or caretakers of the treasure God gives us. If God has blessed me with abundance, it is because he wants me to share some of it with the poor and the needy. What do I do with the gift of treasure God has given me? Have I given to the poor lately? To a needy family? To the Church? Stewardship: Not only for Adults, but for Youth too! Stewardship, you know, is for children, youth and young adults too. Jesus says, "Let the children come to me!" In other words, he wants our young people to recognize how special they are to him. He wants to bless them. And he wants them to share their blessings with others. Our young people also receive the gifts of time, talent and treasure. Oftentimes only they can console a sister or a brother or a friend who is sad; only they feel comfortable in sharing a deep secret with each other; and only their homemade Mother's and Father's Day and Birthday cards make us laugh! Let's teach our children about stewardship. Let's teach them that they, like us, are caretakers of God's gifts to us of time, talent and treasure, and that these gifts are meant to be shared with others. What Gift Have I, Worthy of a King? 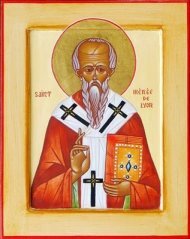 Saint Nicholas the Wonderworker, Archbishop of Myra, is one of the saints most beloved by Christian people. After all, he is the original Father Christmas. 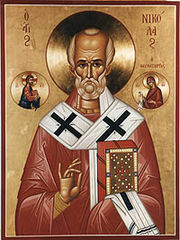 Indeed, Saint Nicholas is uniquely tied to Christmas, the celebration of Jesus' birth. 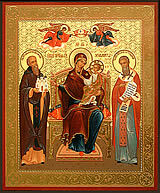 Early stories about Saint Nicholas carry with them the Nativity themes of love and justice. Love and justice are what Saint Nicholas, the man known as the "gift-giver", is all about. He is characterized as a generous and pious servant of God, guarding the soul in this care, protecting children and families, and providing gifts for their spiritual and physical well-being. In the spirit of Saint Nicholas, what gift do you bring now to the infant Jesus, who lays quietly and peacefully in a manger? Now is the time to make a commitment. Will my gift to God be some of my time, some of my talent, or some of my treasure? Remember that God's blessings come in the form of gifts. These gifts are freely given to us, so that we in turn can freely give them to others who are in need. We don't own these gifts. We are their stewards, their caretakers waiting for God to call upon us, share them with others. Let us continue to be good stewards. It takes practice to be good at something. It's not something we can do once and be satisfied. It's a way of life. Together we can make this earth a better place. Together we can help build the Kingdom of God!